Wouldn't the Pilgrims be flabbergasted at all the uses we have found for pumpkins? It's not enough that we eat them. We also decorate them, use them for beauty products, and beverages. Why do we love them so much? Versatility, for one. You can do lot of things with a pumpkin. So this year, get creative and go beyond pumpkin pie with these 20 fun ways to use pumpkins. Repeat after me: Red Thai Chicken and Pumpkin Curry. Yes, it is spicy, so have a glass of Thai iced tea ready. (You can reduce the amount of red curry paste, of course.) To me, this is one of the ultimate comfort foods. I also add carrot to mine and, serve on jasmine rice. 2. Pumpkin Spice Latte, Anyone? These are super popular right now! Naturally, someone has uncovered the secret so you can make them DIY: pumpkin syrup. Why not save some money and make your own? Here's how! Yes, french fry addicts, there is a healthier alternative. Try pumpkin french fries! I liked the ones with the spicy mix that included curry powder, and I did turn up my oven to 400 for the last ten minutes, to get them crispier. They make a fun hors d'oeuvre, too, with a yogurt dipping sauce. This pumpkin smoothie is not only good for you, but also vegan and incredibly filling. I guess I should not have been surprised, since it contains pumpkin, bananas, and Greek yogurt. I had heard of avocado, oatmeal, egg, honey… but pumpkin facial masks were a new one, on me. Various recipes claim that the fruit enzymes, plus alpha hydroxy acids, vitamin A, and vitamin C, will soften and smooth the skin. I am certain that as soon as I cover my face in pumpkin, the doorbell will ring. A cold pumpkin beer, that is. I think these or a love 'em or hate 'em thing. 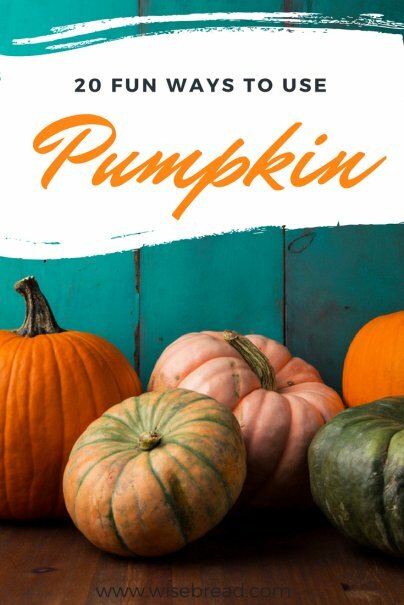 If you are a homebrewer and want to give them a try, you can buy a pumpkin ale home-brewing kit. This pumpkin chili is one of my favorite comfort foods. It has the wonderful, mellow earthiness of pumpkin and the zestiness of peppers and spices. I like it with black-bean tortilla chips and lots of sour cream. It makes quite a bit, so it's a nice one to share, and even better the second day, reheated. Are you a soap-maker? I have yet to try soap-making as a DIY but when I do, this pumpkin soap is on the list. This would make a great gift! It is too humid where I live for carved pumpkins to last for more than a day, so people tend to decorate them, instead. Check out the pumpkin covered in thumbtacks, which is really beautiful, as well as the hilarious "Liberace pumpkin." Both easy and fun, I am going to line the porch with these pumpkin candles this year, for a spooky effect. My girlfriend just sent me a jar of this and I could just eat it with a spoon, although it's wonderful on toast, pancakes, and waffles. Now I just have to make my own! Here is a popular pumpkin butter recipe. Just kidding, but use of the French word "croquette" certainly dresses up smashed chickpeas and pumpkin. Seriously, though, these are habit-forming and delicious. This is a vegan recipe for chickpea and pumpkin croquettes, but I used real cheese. If you make them really small, they make great appetizers, too. Not just for feet (but I think it is particularly nice for 'em) is this Pumpkin Body Scrub. Make a batch soon for a wonderful Thanksgiving hostess gift! These pumpkin pecan pie squares are a hit at potlucks. They also go together very quickly and make a nice size for sharing (they go in a 9 x 13 pan). 15. Don't Forget the Seeds! After carving the pumpkin, save the delicious seeds. I love the spicy ones. The seeds are also extremely nutritious. Risotto is another dish I consider to be "comfort food" — warm, creamy, and full of flavor. Combining cumin and cardamom wouldn't have occurred to me, but the combination works with the pumpkin in this recipe. I love that these pumpkin cookies are delicious, but have more nutritional value than a traditional chocolate-chip cookie due to the addition of oatmeal and pumpkin. If it were just me, I would also add some raisins, but many people are raisin-phobic. This African Pumpkin Stew is so healthy, not to mention hearty. I really like it with the beet greens, which are a little sweeter, but chard or spinach are easier to find. Talk about a healthful stew — it is resplendent with pumpkin, greens, coconut milk, and served with couscous. Non-vegetarians can add cooked pork or chicken. Lighter, but still very satisfying, is this pumpkin soup. Instead of cream, it gets its thickness from skim milk, potatoes, and corn. I finally relinquished it (it was looking pretty sad) but, as an adult, I wore my pumpkin costume four years running. It was a good one. Pumpkins always get a lot of laughs. There is still time to make your own pumpkin costume! I got more fabric and made mine longer, and wore it with black tights. Just think: Your entire family could be a pumpkin patch. Get sewing. There you have it — 20 fun ways to use pumpkin. Readers, any fun stuff to share? Pumpkin smoothies sound great, but if there is Greek yogurt in them, they unfortunately aren't vegan.